You can capture still images while recording movies without stopping recording. Use Dual Rec when you want to record both movies and still images at the same time. Press the MOVIE button to start recording the movie. Press the shutter button to capture a still image. If you press the shutter button halfway down, the remaining number of still images you can shoot will be displayed on the screen. While shooting still images, the message [CAPTURE] is displayed on the screen. Press the MOVIE button again to finish recording the movie. 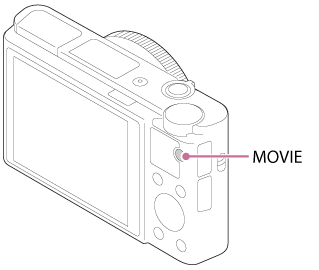 The image size or image quality of the still images can be selected from MENU → (Camera Settings)→[Img. Size(Dual Rec)]/[Quality(Dual Rec)]. Dual Rec may be unavailable depending on the recording setting or mode setting. Depending on the memory card you use, it may take a while to record a still image. The shutter button sound may be recorded. You cannot use the flash while using Dual Rec.